​Could pee-resistant paint curb public urination problem? 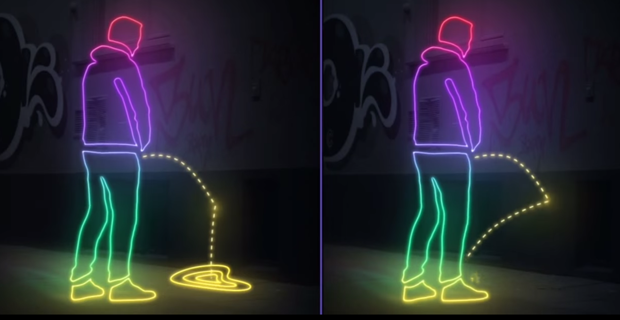 SAN FRANCISCO -- San Francisco's Department of Public Works is looking into a new weapon of sorts to combat those who urinate in the streets, alleys and on sidewalks: A high-tech, liquid-resistant paint that would repel the waste, splashing it back at the offender. CBS San Francisco reports Mohammed Nuru, head of San Francisco's Department of Public Works, is open to suggestions to combat those who might not have manners and use public space as a urinal, or the homeless who might not have a better place to go. San Francisco is notorious for its stench in some neighborhoods, stemming from those who pee in public. The Chamber of Commerce sees it as a growing concern and a quality-of-life issue. The liquid-resistant paint is already being used in other cities, including Hamburg, Germany, known for unruliness in its red-light district. Community group IG St. Pauli painted walls in the neighborhood and hung signs warning, "Do not pee here. We pee back!" A YouTube video of the Hamburg experiment is what grabbed San Francisco leaders' attention (watch it below). "Prohibitions and fines do scarcely anything," an IG St. Pauli member says on the video. "So we decided to solve the problem our own way. Now, St Pauli pees back." "We saw this report on the Internet and thought it looked interesting," Nuru told the San Francisco Chronicle, adding that the DPW is considering testing the paint in areas where "it's costing us a lot to send teams out and do clean-up". San Francisco passed legislation banning public urination in 2002 but the law has had a little success, even though fines can range from $50 to $500. "We know it's a problem and we're out there - our foot beats and our mobile patrol units. We're out there trying to enforce these kinds of violations," police spokesman Sgt. Dennis Toomer told the Chronicle in 2007. "When we do spot something we take action on it, but we have limitations. We're trying our best." In the first six months of 2013, San Francisco received more than 5,600 requests for steam-cleaning sidewalks, the majority of which were caused by human feces, according to CBS San Francisco. Bay Area Rapid Transit officials say human feces is responsible for gumming up many subway station escalators. In June of 2012, work crews opened up the broken BART escalator at San Francisco's Civic Center Station and found so much human waste that they had to call in a hazardous-materials team, the station reported. The pee-resistant paint is called Ultra-Ever Dry, made by a Florida-based chemical cleanup and waste management company called Ultra Tech. The company describes it as "super-hydrophobic" and says it has practical applications, water-resistant boots and gloves being a prime example. Suggestions for where the city should test the paint can be submitted to dpw@sfdpw.org. "If a suggestion sounds reasonable, we'll try it," Nuru said.